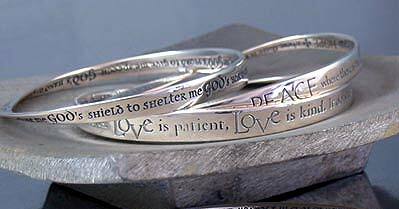 Beloved inspirational verses are finely engraved onto a beautiful Möbius strip bracelet. The geometric form known as a Möbius strip represents the paradox of a plane without end, or of infinite length. It became accepted as the symbol for infinity, and is an appropriate and symbolic form for these profound insights.These are the original DVBNY Möbius bracelets. Made in USA. Each Mobius bracelet is available in polished Sterling Silver or 14k Gold and includes a historical background story card and a black velvet storage pouch. 14k Gold Bracelets are available at market price.